Stories are what I thrive on; and what better than a story which starts with a teenager in Sheffield making a caravan. Scavenging for materials in post war Britain he used Ponds skin cream jars for the light fittings. David Mellor is the teenager that I am describing. He went on to earn the title of "Cutlery King". But he designed so much more than just cutlery. When I was 13 I spent a weekend in London with my Mum. It was one of those special mother and daughter weekends. We went to the V&A and to Liberty’s of Regent Street, we saw Andrew Lloyd Webber’s "Evita", we ate some very posh sausages at The Greenhouse in Mayfair (It was John Tovey’s restaurant at that time) and we also went to David Mellor’s Kitchen shop. It was 1977 so it would have been his Sloane Square shop. The things that you accept as normal when you are a child… I accepted that when out with my mum we went to kitchen shops (usually spending the most time in the china department). My own children know that when out with me there is a very strong possibility that there is an unusual museum nearby or an art gallery at least. I stored away all the memories from that London weekend. It was special; we lived in Central Scotland and it was my first real trip to London. When I got married I was 24 and I would have loved to have put David Mellor cutlery on my wedding list. I think my favourite design at that time was “Flute”. Sadly we couldn’t agree; I think that it came down to the fact that we preferred to have two spoon shapes one for soup and one for desserts. (One of Mellor’s ambitions was to refine and simplify and so he had worked on devising the fewest items of cutlery actually needed…. 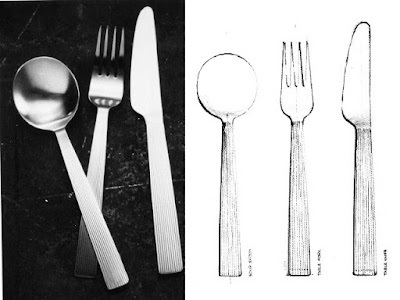 You don’t see fish knives and forks in a David Mellor range). "Flute" designed in 1983. Photo by Pete Hill. I have now been married for 22 years. And David Mellor’s career has been a notable one. Visiting London Design Week events I still drool over his designs. My favourite now? Possibly "Hoffmann". David Mellor was an advocate of Modernism and "Hoffman" has been described as being, to some extent, an homage to early 20th Century mid-European metalwork. I am also fascinated by people’s homes and how they live, so what a wonderful book “At Home with the Makers of Style”. Reading this book back in 2006 I studied each photograph. David Mellor is one of the designers featured in this book. It was then that I read about his Round Building cutlery manufacturing site and home in Hathersage, near Sheffield. So this Easter we made it. The trip was first planned to go to buy some “posh sandpaper” (Micromesh finishing cloth) from Craft Supplies. I am finally finishing a being(sculpture) called "Rachel". She’s a cross between Barbara Windsor and Mae West… so of course the sandpaper needs to be posh! Hathersage is only 3 miles from Craft Supplies so obviously the time had come to visit The Round Building! The building was designed by Sir Michael Hopkins. It was built (1990) on the foundations of an old circular Gas Storage container and has been described as minor masterpiece of modern architecture. Although my photos don't show it it sits in exceedingly beautiful countryside. You can walk round the factory and watch the cutlery being made. Mellor was a designer who was completely involved with the making of his designs. Although he introduced a lot of technology he still retained the handmaking skills and hand finishing of each item. He admitted to being a perfectionist. I find this machine really sculptural. I get inspiration for my Frillip Moolog beings from an ecclectic range of sources. Not only that but he used his own workforce when building, renovating or fitting out his premises. Of course you are going to feel pride and belonging if you actually contributed to the making of the building that you work in. There are 480 Finnish plywood roof panels to make the roof of the Round Building; these too were made by Mellor’s own workforce. “Mixing concrete and foundations on a bitterly cold Sunday was a typical situation which I learned to expect….working with him you surge forward on a tidal wave of unbounded enthusiasm and there is never any question of defeat”. Ron Carter furniture designer and old friend from RCA talking of his involvement with the design and shop fitting work on the Sloan Square shop. Yes this is what you’d expect from such a name in design history; drive, passion and self belief. Park Lane was the first of Mellor’s live work buildings. A point to note is that this building was designed (1960) with two thirds of the space devoted to design studio and manufacturing workshop and just one third for living and sleeping space. (The same proportion that he divided his time.) His bed actually slid out into the living room from under from under the kitchen work units! Yes a driven and committed man I would have loved to have met him. Recognise the salt and pepper set in the left of this photo? "Fanfare" condiment set was designed by David Mellor in 1961 and has been copied the world over. Another game that I enjoy is “How Many Degrees of Separation?” I love when I can make connections and often during a chance conversation you can discover that you are more closely connected to someone than you might have believed. Sitting in the cafe area within the David Mellor museum I discovered that the gentleman sitting beside me was Brian Edwards, an old friend of David Mellor’s. 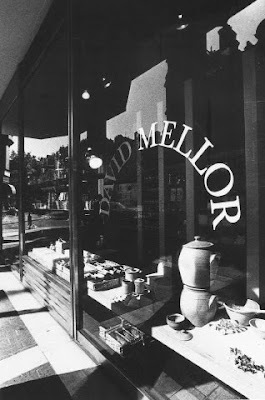 On realising that I was more interested in David Mellor than my posh sandpaper he revealed that he had known David Mellor from the early days of his career. Infact he had interviewed David Mellor for one of his very first design jobs. Brian Edwards described his business as being office workstations specialising in Danish and Scandinavian designs. Now that I realise that he owns Shape Posture Seating I realise that I could have mentioned that I owned a kneeling stool back in the 80’s. Lots of student studying was done on it. And also my own very early exposure to Danish design; my memories of eating Open Sandwiches at the Danish Design Centre in Glasgow. These were trips with my Nan and my mum I was very young but I definitely soaked up those sensory experiences. Brian owns a set of David Mellor "Pride" cutlery. He started collecting it when he got married. What a wonderful name; "Pride". David Mellor was still a teenager when he first designed it and it went into production while he was still a student at RCA. It has now been in production for over 50 years! Press plates for making "Pride" cutlery. Brian Edwards was having lunch with Keith Tyssen. He introduced Keith as one of the country’s leading designers in silverware. It was a funny feeling, I was so excited to have the chance to speak to these old friends of David Mellor’s (Keith Tyssen was quick to mention that David Mellor had given him his first “leg up” by giving him free access to use the studio space at Park Lane when he first graduated) but I didn’t want to sound too gushy. People can get the wrong idea when I get excited! They both spoke fondly of their friend; sadly David Mellor died last year. But how lovely that they can still meet, to discuss design, appraise architecture and have a lovely lunch surrounded by reminders of their old friend and colleague. And finally how to make this connection even closer? Aberdeen has a very impressive collection of silverware and actively invests in work by contemporary makers so it was no surprise that Keith has met Christine. Yes he has work in Aberdeen Art Gallery’s collection. So not bad for a spur of the moment trip for some posh sandpaper! Examples of David Mellor's designs for street furniture: traffic lights, pedestrian crossing equipment, waste bins, the square letterbox and bollards amongs others. So certainly not "just " the Cutlery King. David Mellor's designs are all around us. He has had a huge impact on our British visual culture.